I haven’t set foot in a Lutheran church in years. Our family grew up rather unstructured in a non-denominational church, and it destroyed my attention span for more traditional types of services. It meant a lot to Dad that I attend with him and meet his pastor, so I braved the solemn atmosphere and organ music, the hymns and special prayers. 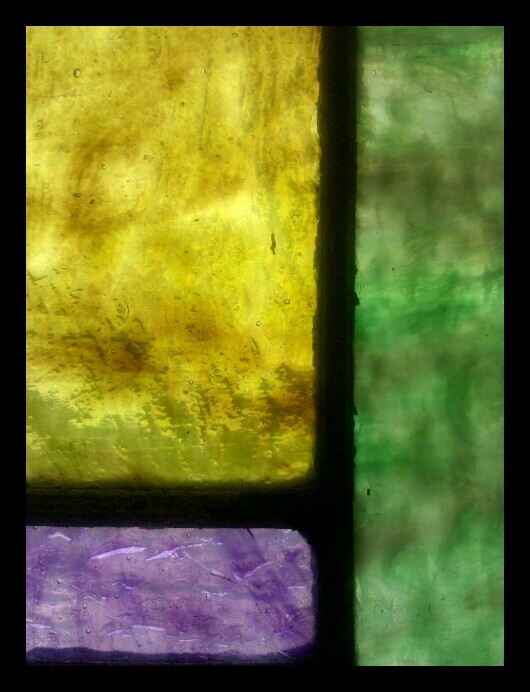 What I do appreciate about Lutheran churches (well, and Catholic churches as well) is the stained glass. This is just one small piece of a window, but from a distance most of these individual blocks build a picture of a biblical scene. Unfortunately, the lense on my Droid wasn’t able to capture the full affect due to the back lighting.